Two came forth and Garidth could see a third hovering in the gateway, only half armoured. The other two – wearing maille and open-faced helms – drew their swords and closed on Garidth. Garidth couldn’t help but smile as the words of his old tutor echoed in his ears, “if someone attacks you with his blade in a standard grip when you are in full plate, then he knows nothing of the True Art”. His blood singing, Garidth launched his attack, thrusting hard at the one to his left, but the man’s sword came up in time to glance the thrust to the side. Against the Hämähäkkan’s expectations, Garidth continued his push and quickly whipped his steel-clad left fist forwards in a straight jab, smashing into his opponent’s face. Already turning as the stunned man stumbled back, Garidth blocked the second soldier’s overhand strike with his right vambrace. Garidth couldn’t help but let out a grunt of discomfort as the heavy sword bit into the steel, but before the Hämähäkkan could recover his guard, he swung his blade towards himself and caught it in his left hand. 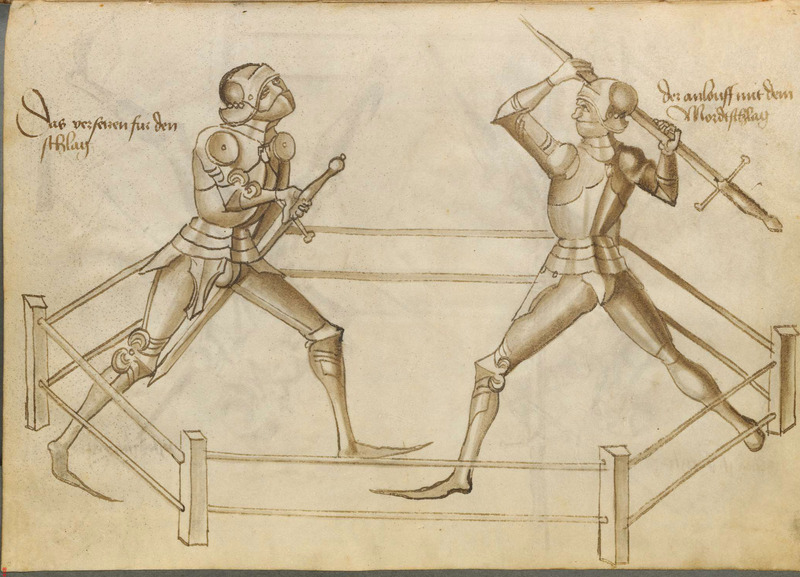 Without pausing, he slammed the pommel into the bridge of his opponent’s nose and fractured his skull. The man dropped. His first opponent began to gather his wits a moment too late as Garidth’s sword got behind his knee and took his feet from under him. Garidth immediately thrust his blade down, two-handed, at the maille protecting the man’s throat. Steel rings split beneath the blade’s tip. Garidth paused for a moment to catch his breath, and withdrew his sword as the third member of the gatehouse came out. Garidth eyed this new combatant; clad in brigandine, the way in which he held himself was different from the other two Hämähäkkans he’d fought. Unlike the others, this one had adopted a half-sword stance and had solid plates on his arms and legs complimenting the brigandine and visored helm. Garidth found himself suddenly wishing that he hadn’t lowered his buffe earlier; there was no time to secure it back in place now. Blood dripped from the tip of Garidth’s longsword as he gripped it halfway down the blade. Suddenly the Hämähäkkan whipped a spring attack toward Garidth’s exposed face, Garidth expected the move and swayed back; half an inch less and he would have lost an eye. He immediately responded with a mortschlag blow, intending to smash his pommel into his foe’s visor. The Hamahakan saw the blow coming and tried to set it aside with a half-sword deflection, but instead the cross-piece glanced off the vambrace protecting his forearm. He followed with a pommel thrust, again to the face of Garidth; the young knight deftly parried and brought his sword though for a second mortschlag. The Hämähäkkan quickly made a back-step while warding off the blow with his forearm, and then he caught the blade in his hand. Garidth instantly closed in to grapple, so as to prevent his foe bringing his own blade to bear, but the Hämähäkkan rammed his knee into Garidth’s midriff, stopping him from getting too close. Garidth cast his sword aside and used both hands to attempt a second grapple, but again failed to achieve any sort of useful leverage. The Hämähäkkan continued to strike with his knee, keeping Garidth off-balance before managing to sweep the Corlynen knight from his feet and throw him to the ground. Garidth went into a roll as soon as he hit the ground, loosing his helm but turning in time to parry his enemy’s own mortschlag by catching it on his left vambrace. Seizing the Hämähäkkan’s blade, Garidth wrenched it free and simultaneously blocked a forearm smash to his face with his own right arm. As the Hämähäkkan attempted to achieve a hold and throw him again, Garidth put his elbow against the man’s neck for leverage as, holding his foe’s sword by the ricasso, he worked the sword point up, underneath the chain skirt and into the Hämähäkkan’s unprotected groin. Red ran, and the Hämähäkkan shuddered and fell. Eruantien’s action sequence is a little different to our usual Inkblots content. Serving the purpose as a short snippet and nothing more, we understand the level of dedication these men have to their duty and to the fights they undertake. We don’t need to know a back story to their characters, this is a snapshot of another life – what we may see when looking at a picture from the 1970’s, for example. Eru’s piece was written as part of an exercise to understand swordplay and improve his action sequence writing – it’s clearly worked as we’re hooked! If you’d like to see more of Eruantien’s writing, check out “An Address to the Coconut” and “Letters from the Front“.